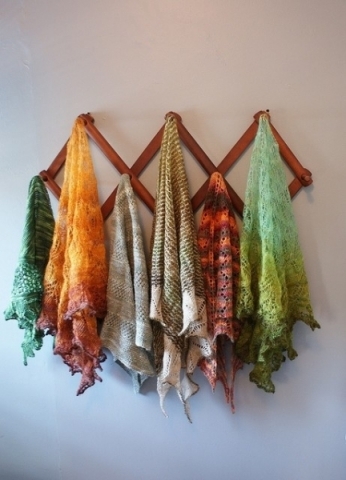 Several months ago, right before summer started, my friend from the blog Knittoo, posted an inspirational picture of several lace shawls on Pinterest. When I saw those gorgeous shawls made by the talented NJSTACIE, it inspired me to make lots and lots of lace shawls myself. I decided that I was going to carefully "study" lace knitting and boy did I have fun doing so. I have made 8 shawls in total over the last couple of months and I enjoyed making every single one of them. Today, I would like to share several of my favorite shawls with you, all of which are modeled by my gorgeous friend Marie. 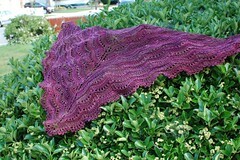 My favorite shawl is the one designed my Emily Ross called "Haruni". 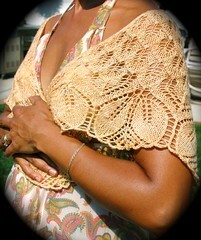 This beauty of a lace shawl, my friends, reigns supreme! This shawl was so much fun to knit and I simply love all the lace details. It is extremely well written and it is very entertaining to knit. The outcome is simply stunning and I have the urge to knit this design in many more colors. Here is a close up, isn't it just breathtakingly beautiful? As with all of Evelyn Clark's patterns, this one is very well written and very easy to follow. Oh my word, does it look good on Marie or what? In the original Holden design, only the bottom part has the wavey patterning. I however, made it an all over patterning. I like how it came out! This pattern has a very nice rhythm to it and very easy to knit. And guess what? 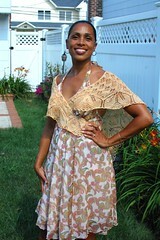 designer Mindy Wilkes is offering this pattern for free! Isn't great how we inspire each other to knit beautiful items? 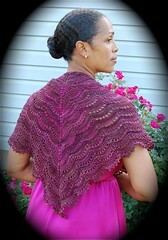 NJSTACIE's beautiful medley shawl picture inspired me enormously and jolted me to go on a lace rampage. 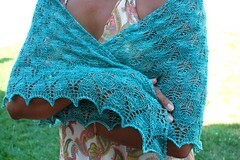 And hopefully, I on my turn will inspire you to pick up your needles and try your hand on lace shawls. This is what I love most about my craft...how we inspire each other. So... what are you waiting for? Which one are you going to knit? Let me know! 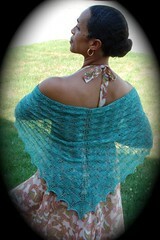 Special thanks to NJSTACIE for letting me use her Medley Shawl picture in this blogpost. Submitted by Anonymous on Thu, 08/18/2011 - 05:50. Submitted by Nancy Ricci on Fri, 08/19/2011 - 14:04. Hi Joanne!!! Glad you found me again!!! Submitted by Anonymous on Sat, 08/13/2011 - 22:05. Submitted by Nancy Ricci on Mon, 08/15/2011 - 00:56. 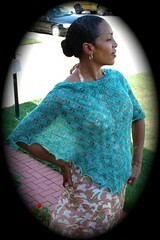 Hey there, I loved knitting these shawls so much... hope you are having as much fun knitting lace as I do!